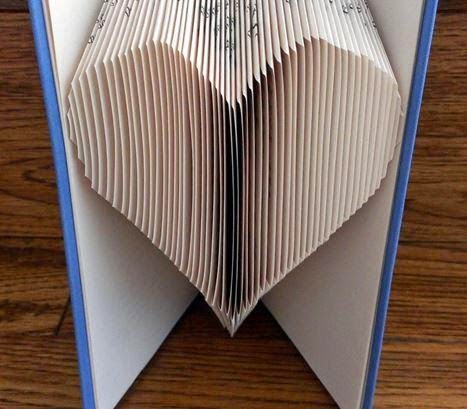 I stumbled upon this the other day - recycling old books by folding the pages to make different shapes. Most people start with something simple like a heart - but I decided to dive right in and make an owl! You need a large hardback book of at least 500 pages - I picked up mine for 20p at the Drinkstone table top sale. It didn't look like anyone had ever read The Crown by Candle Light by Rosemary Hawley Jarman from 1978! I bought the pattern from a seller on Etsy who has loads of other patterns such as rabbits, dogs and elephants as well as words like Love and Bride & Groom. 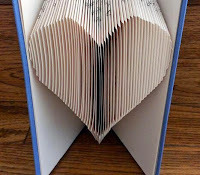 Why not google imagesunder Book Folding Art and see what others are available?